A native of Paris, Arkansas, James L. Neihouse attended Brooks Institute of Photography in Santa Barbara, CA where he received a bachelor’s degree. Soon after graduation Neihouse worked on his first IMAX motion picture, which was directed by Graeme Ferguson, one of the co-founders of IMAX. The film was Ocean and was the first underwater film made in the format. In 1980 he was director of photography on The Eruption of Mount St. Helens, the first IMAX film to be nominated for an Academy Award. Since that time, he has gone on to work on more than 35 IMAX and other large format films. He has contributed to some of the most successful films in the format – The Dream Is Alive, Space Station 3D, HUBBLE 3D, and Ocean Oasis, to name a few. He has filmed polar bears face-to-face in the Arctic, wild tigers in India, chimpanzees in Africa, The Rolling Stones on tour across Europe, space shuttle launches, NASCAR racing, great white sharks, and elephant seals, as well as countless other subjects. 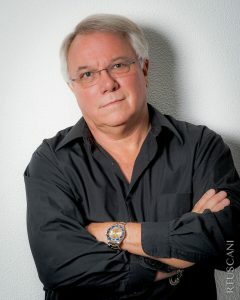 James’ work has garnered him many awards and accolades including two Giant Screen Cinema Association Achievement Awards for Best Cinematography, a Kodak Vision Award, and Imaging Alliance 2017 Visionary Photographer award. He was named as a distinguished alumnus of both Brooks Institute and the University of Central Arkansas. Neihouse is a member of the American Society of Cinematographers and the Academy of Motion Picture Arts and Sciences.